I'm Here. I'm Queer. What the Hell do I read? 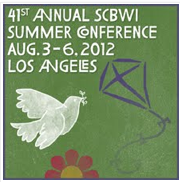 : #LA12SCBWI - Day Four! I'm beyond excited to be taking two intensives today, one on Non-Fiction with Melissa Stewart, and the other led by the incredible Linda Sue Park, called "Spitshine: Putting the Final Polish on Your Novel."